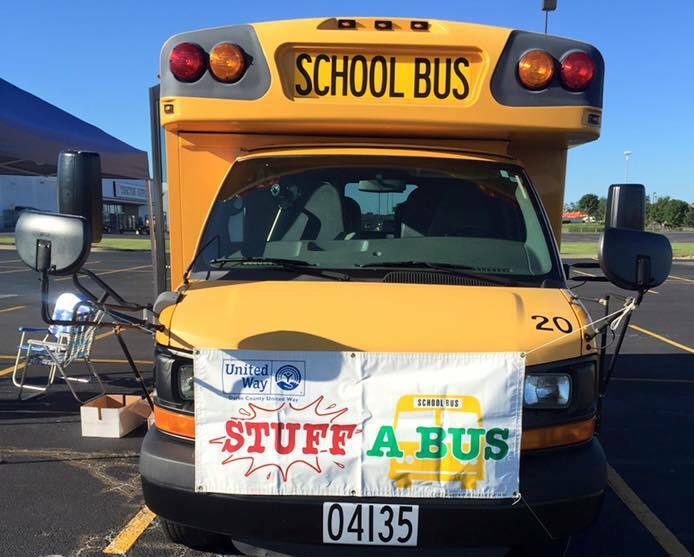 Greenville, OH (June 26, 2017): The Darke County United Way is once again having its annual Stuff A Bus school supply drive to collect school supplies and distribute them to all Darke County school districts for students in need. Items needed include: paper (wide and college-ruled), composition books, #2 pencils, blue and black pens, erasers, rulers, glue sticks, safety scissors, markers, washable markers, highlighters, post it notes, crayons in 16 or 24 packs, single subject notebooks, colored pencils, pocket folders, calculators, pencil sharpeners, pencil pouches/boxes, dry erase markers, backpacks, lunch boxes, ziplock bags, tissues, and/or antibacterial wipes. Collection day is Friday, July 28th from 9:00 am-4:00 pm in the Buffalo Wild Wings parking lot in Greenville and from 9:00 am-2:00 pm at Dollar General in Versailles. If you would like to drop off school supplies before July 28th, please drop items off at the following locations: Farmers State Bank – Greenville and New Madison Branches, Greenville Federal - main office, Greenville National Bank – Broadway branch in Greenville and branches in Ansonia, Arcanum, Bradford, and Gettysburg, Greenville Public Library, McDonald’s North and South, Second National Bank – Broadway branch in Greenville and Arcanum & Versailles branches, Versailles Savings & Loan office in Versailles, and the Darke County United Way Office. Stuff the Bus benefits children in the following school districts: Ansonia, Arcanum, Bradford, Franklin Monroe, Greenville, Mississinawa Valley, Tri Village, Versailles, and Board of Developmental Disabilities. The Darke County United Way fights for the health, education, and stability of every person in our community. For more information, contact the Darke County United Way at 547-1272 or unitedway@darkecountyunitedway.org.